This post is sponsored by DOG for DOG and the BlogPaws Professional Pet Blogger Network. I am being compensated for helping spread the word about DOG for DOG being available at PetSmart Canadian stores. DOG for DOG and PetSmart are not responsible for the content of this article. Dog for Dog’s mission is to sell products that help give back to their communities: For every product you buy, one is given to a pup in need. This charitable mentality of helping rescues was one of the things that drew us to this company. 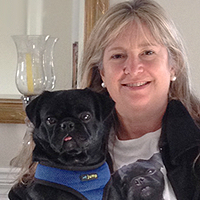 I had the pleasure of meeting the founder, Rocky Kanaka, at the BlogPaws Conference. He explained how he always has had a passion for producing healthy dog food and treats. It was his goal to share that level of care to dogs in need. 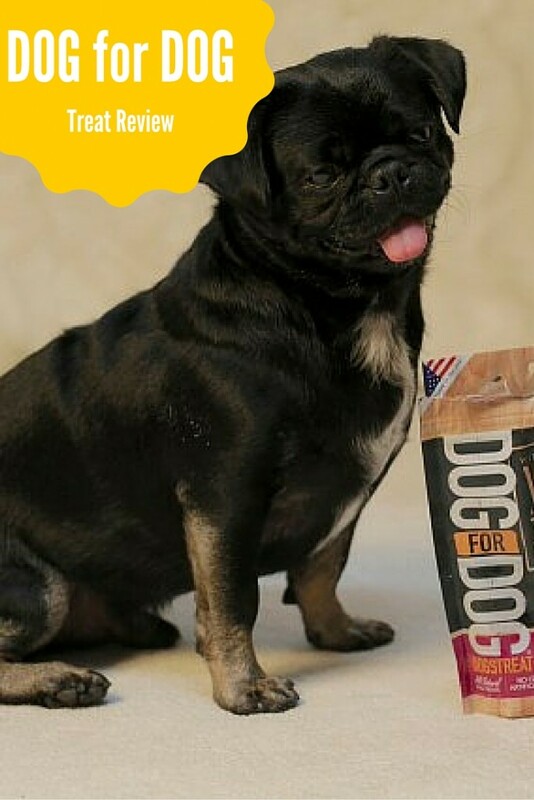 We received a free sample of the dry dog food at the conference and Kilo the Pug gave it a glowing slobbery review. Look out for it in your local store! I was thrilled to be offered the chance to do this review as I was planning to buy both their Natural Dog Treats and their Peanut Butter for Dogs when I heard they were available at PetSmart Canada. I confess that Kilo the Pug and I are both peanut butter fanatics – we have a tiny bit at breakfast most days. We went over to my local Toronto PetSmart store and picked up three products: DOGSTREAT MINIS, DOGSBAR, and DOGSBUTTER. DOGSBUTTER is peanut butter made especially for dogs! It’s all natural and gluten free with no added salt, sugar, or hydrogenated oils. It needed a little stir when I opened the jar as some of the ingredients had separated on the shelf, but the texture and smell were wonderful and very similar to human peanut butter, but missing any harmful sweeteners. I add it to banana and yogurt to make Kilo’s favorite smoothie. I also put a little on a wooden spoon to teach Kilo to walk properly on his leash, and also to teach him to dance, walk upright, and do other adorable tricks. DOGSTREAT MINIS are a natural small treat perfect for pugs like Kilo with little mouths and are ideal to use for repetitive rewards during training as they’re perfectly snackable. MINIS are free of corn and wheat and come in two delicious flavors, one savory and one sweet. We got the duck flavor and Kilo looks forward to getting them! The smell and taste really get him excited, but he did do a good “wait” –however reluctantly. He also likes the texture. I squished them in half and made him work for them, which helps make training enjoyable. He was overjoyed with our training sessions! He even posed for a few holiday photos in costumes he was not keen on, as putting Kilo in a sweater is quite the challenge. DOGSBAR is a healthy nutrition bar for dogs. We are all so busy at this time of year (or, well, anytime really), I think these are a great idea for use on the go. Kilo got a little taste and immediately begged for more. He would have eaten the whole bar if I had let him but he will just get a tiny taste each day over the next few days to make it last.